Liven up the mood of someone special by gifting this Classy Happiness Gift Basket of Deepawali Treats that carries all the elements to make this festival of lights filled with happiness. This adorable Gift Basket is combined with 3 Pc. Handmade Chocolates in Heart Shape Box, 5 Pc. 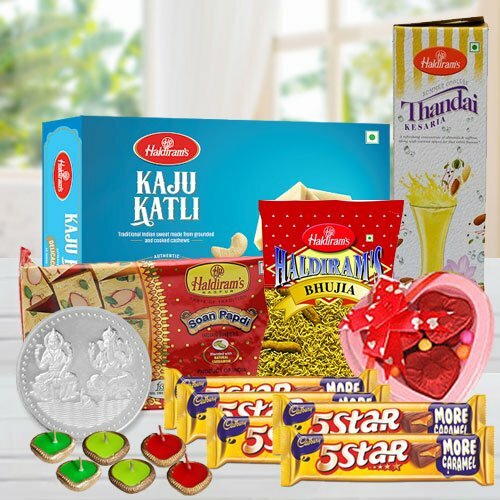 5 Stars Chocolates, 5 Diyas, Haldirams Thandai Bottle of 750 ml, Haldiram Soan Papdi pack of 250 gm., Haldiram Kaju Katli pack of 250 gm., Haldirams Bhujia pack of 250 gm. and a complimentary Silver Plated Laxmi Ganesh Coin. Note: Depending on availability Basket design may vary.